I spent yesterday spring cleaning the house. I only got through the hall, our bedroom and Scarlett and Jemima’s room (which is a bit depressing because I hate cleaning). Still, they really are done from top to bottom. So as I was cleaning I was thinking about a post for today, and as I cleaned this chair I thought I could write about it. It sits in our bedroom and is the collector of cycling clothes and Clive’s ugg boots. We inherited it from Clive’s uncle Phil, his Dad’s brother. Phil inherited the chair from his father’s business, and stripped it and restored it. And Phil had a story about why he had to strip the chair. It started off something like ‘Arthur was always …’. This chair. That’s the story. And Phil wanted to make it look nice, so he stripped it back. I wonder if it would be worth more today if Phil had left the Arthur Boyd orange on? Anyway, it’s a nice chair and I like knowing that it has an orange/arty history. And Phil did a super job restoring the timber. We use it every day. If I had to describe my friend Ali I think I would call her an urban farm girl. She bakes and sews and crafts and cleans and volunteers. I am 100% sure she irons. She’s a prolific cook. She has chooks and fish. She used to have a duck. Last year she had a guide dog puppy. And she also adopts stray people. I went around to her house and she had a new house guest, a roast in the oven … that was going to turn on automatically (she’s the only person I know who owns and NEEDS two ovens), carrots cut ready to go for dinner, bread dough rising by the fire (yes, she has a Coonara to heat her living room) and a multitude of crafty projects out … and all at 2 pm. Sometimes I’ve known her to comment that she’s baked two cakes before school drop off. I’m lucky to have done my hair! She is ACTUALLY a farm girl. And Norm is a farm boy … but now they live in the city. I think that explains it. Ali’s house is a warm and friendly place. It is full of things she’s made and things she loves. At her front door there’s a great collection of stuff. Plants, metal boxes, a trolley, an old church pew. It’s all placed thoughtfully, and there’s a story behind it all. Her hall is lined with art work by her kids, all framed. And then there is a pile of suitcases. And a doorway decorated with a birdcage and fake flowers. Did I mention Ali loves craft? In her house she’s made great cushions, recovered chairs and has taken her yoyo thing to a new level with this yoyo lampshade. I really like it. It looks super cute in Emma’s room. And she shares her crafty skills with her kids – check out the glove people Emma made. A couple of years ago when she did her extension (which is when the two ovens arrived on the scene) she also put in an ensuite. I like the rustic bench the basin now sits on in there. And how cool to have a shower that you can comfortably fit an old wooden stool in as decoration (you can barely turn around in our mini bath with shower overhead). And in her more formal area I like how she’s combined the ghost chair with the old hospital screen. I do like it when people mix unusual pieces of furniture. There’s heaps more second hand inspiration outside. But it’s too good. 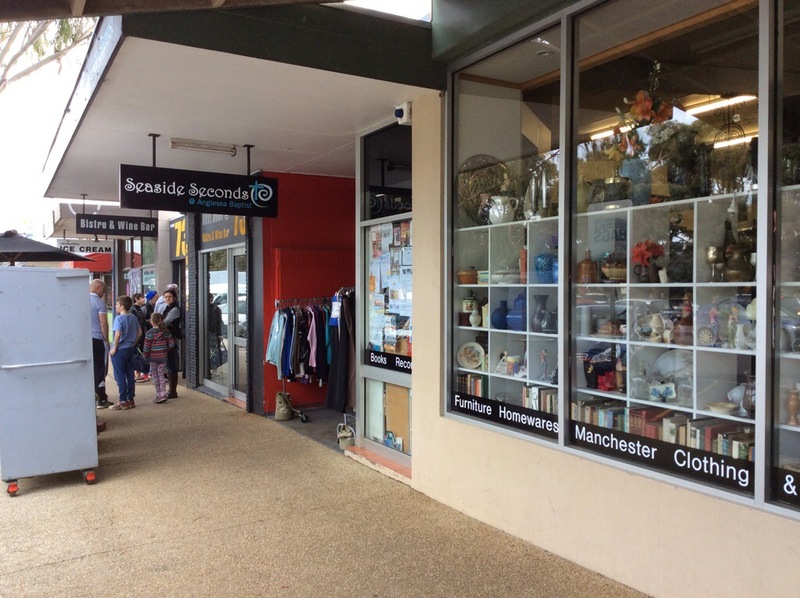 I’ll save the garden for another post … look out for part 2.
anglesea op shop – is it the best in the world? We are super lucky to be down at Airey’s Inlet, and yesterday I headed in to Anglesea for some op shopping. I love the kitchen room at this op shop. Actually I love every room at this op shop. 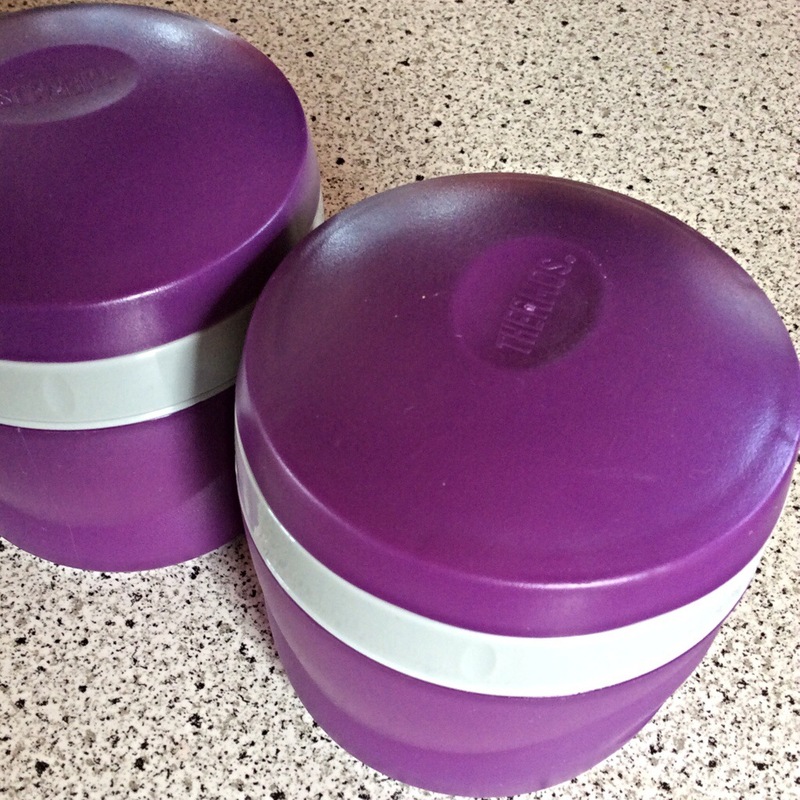 And straight away I found 2 little containers for the kids to take hot food to school. 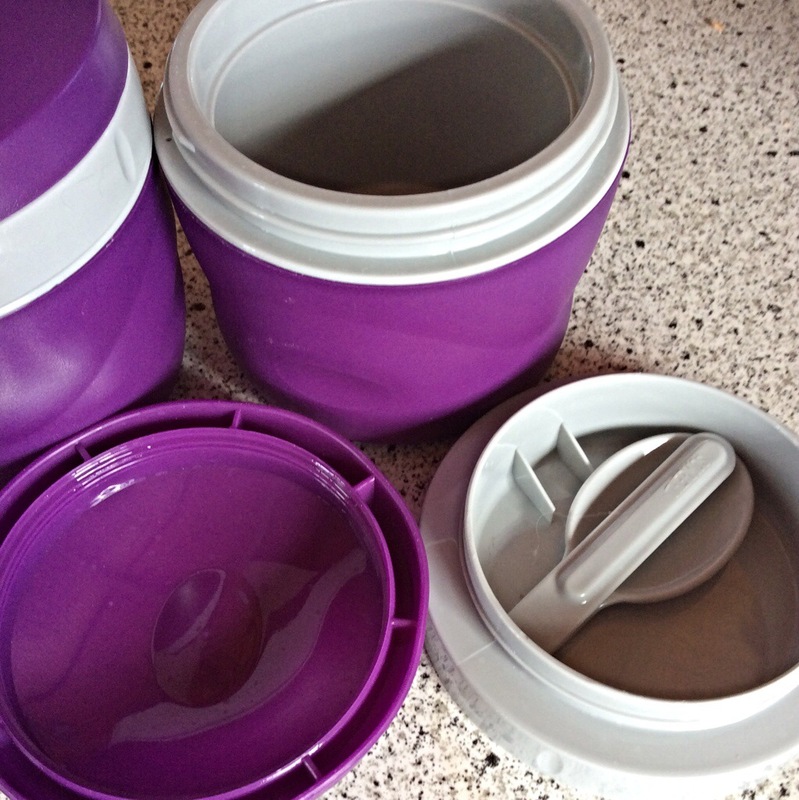 Thermos brand, spoons included. How great! 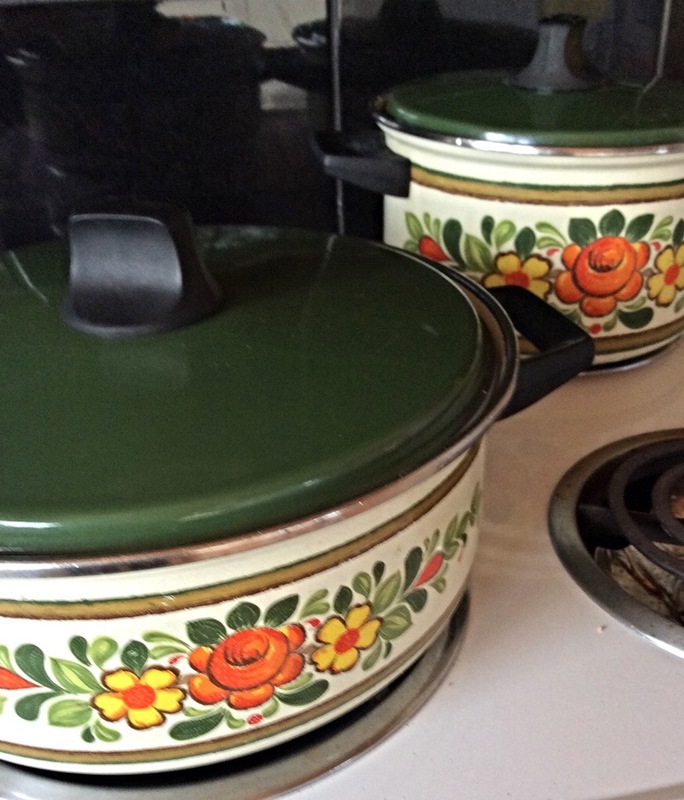 And check out these saucepans, heavy, enamelled, great condition, excellent shape, super kitsch … They’ll add a touch of ‘fun floral european yesterday’ to wherever they finally reside. 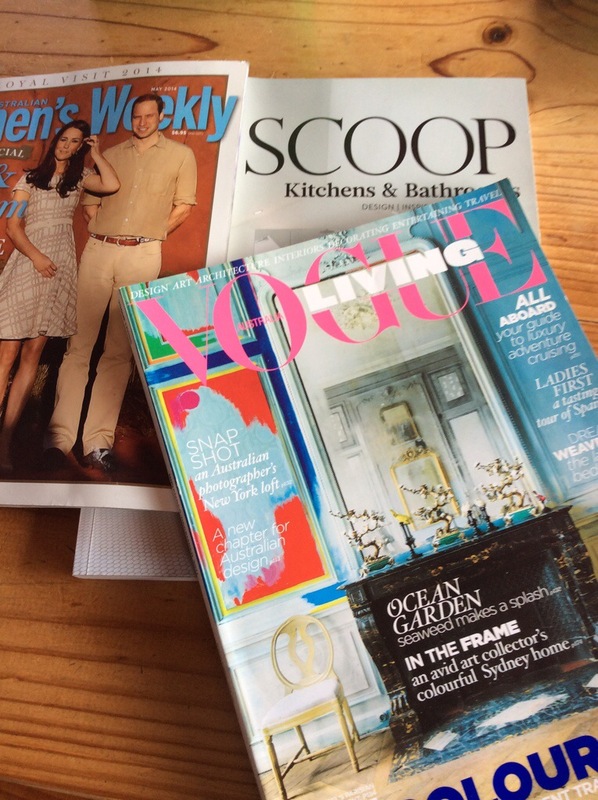 And I got some mags for 20 cents each – holiday reading and crosswords in front of the fire. Perfect. Bathrooms, kitchens, Royals. Bring on the bad weather, I am ready!